Marketing for small businesses is never an easy task. Whether it is deciding to spend money on advertisements, creating new public relations initiatives, or simply focusing on social media, there will always be endless questions on how to further expose your brand to potential buyers. However, occasionally there are select opportunities that allow a company to promote its product while tying in a great message. Recognizing the opportunity and capitalizing on it is critical. 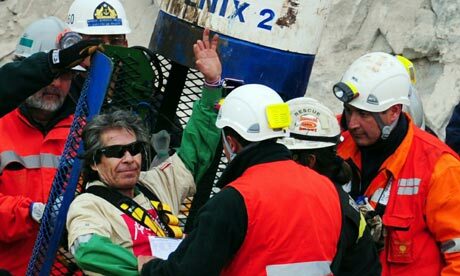 The most recent example of brilliant marketing and public relations is through the Chilean mine situation, in which the 33 miners were successfully rescued. When rescuers were organizing and planning how to properly bring the miners to the surface, countless issues had to be considered. Beyond the immediate physical health of each miner, additional concerns were given to the fact that the miners were underground for 69 days and therefore were not exposed to heavy lighting or natural sunlight. Each miner needed to protect their eyes as they approached the surface in order to preserve their vision until their eyes properly adjusted. Here is where the brilliant marketing comes in. Oakley became aware of this situation and committed to aiding the rescue efforts of the miners by donating 35 pairs of their Oakley Radar sunglasses. The donated sunglasses ensured that the miners’ vision would be protected as their eyes adjusted to lighting, which may take up to a few days. It should be noted that the donated sunglasses are reportedly priced between $180 and $450 per pair. Consider what marketing impact this donation provided for the company. Most major news networks in the world were present at the rescue scene as each of the 33 miners was brought to the surface. After exiting the capsule that transported them, each miner was seen wearing a pair of Oakley sunglasses. Calculating the return on investment, Oakley spent roughly between $6000 and $15,000 (in retail value) for positive brand exposure, great public relations as well as long-lasting community goodwill. That is probably a drop in the bucket compared to what they spend annually on marketing. Exposure to this magnitude is something that typically can’t be purchased. Not only did Oakley receive tremendous value from this exposure, but they aided in the long-term visual health of the minors. While the real intentions of Oakley’s donation may not be known, the result will likely only yield great things for the company. According to a post on the Oakley website, the company was contacted by a Chilean journalist who initiated the relationship between the company and the rescue effort. Whether or not this is true is irrelevant. What is relevant is the fact that Oakley took advantage of a great opportunity that allowed their brand to be tied in with one of the most historic stories of recent time. Examples of these marketing foresights and opportunistic action occur all the time. Whether or not your company takes advantage of a situation is up to you. It should be strongly noted that by no means am I advocating for the exploitation of a tragedy for the benefits of a company. What I am advocating for is for marketers, business people and entrepreneurs to be aware of ways to get their message out while positively contributing to a cause or effort. Oakley did this in a subtle yet creative way. Your business is no less suited to do something as impactful. If you are aware of other examples of companies taking advantage of a marketing opportunity, I would love to hear it. Feel free to leave a comment in the comment section below. Previous Previous: Will Your Company Be Relevant In 3 Years?